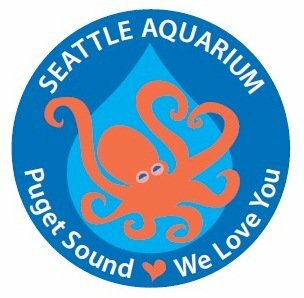 You might not know that the Seattle Aquarium makes up to $20,000 over the course of the year our youth volunteer run face painting station alone. It’s pretty incredible, considering that face painting is free; the money all comes from donations. What better way to use this money than to donate it to ocean conservation causes? After all, our mission is inspiring conservation of our marine environment. This year, I was a member of the aquarium’s Youth Philanthropy Team, which is a group of Youth Ocean Advocates that work together to decide how the face painting money should be spent. There are two of these teams throughout the year, a school year and a summer team. Being part of the summer program, we were given a portion of the money – $5000 – to spend however we liked. We decided to distribute it through blind donations. Everyone researched an ocean conservation organization that was running a project taking place in one of the following places: Washington, Oregon, California, Alaska, British Columbia, western Mexico, or Hawaii. Each member then presented their findings to the rest of the team, and together we decided on how much money each organization should get. While researching, I discovered the Hawaii Wildlife Fund. They are an amazing organization that does a variety of conservation work for wildlife throughout the Hawaiian Islands. I personally have a bit of an obsession with sea turtles, so when I saw their Hawksbill Sea Turtle Recovery Project, I knew it would be where I wanted to donate the money. As I continued to dive deeper (no pun intended!) into my research, I was more and more impressed with the project. With a very small budget of 30,000 dollars a year, they manage to make a huge impact through a variety of conservation efforts. The project draws many volunteers, Hawaiian residents and visitors, for beach cleanups, dune restoration, fence repairs, and much more. In addition, they advocate for beachfront lighting reductions. When baby sea turtles hatch from their eggs on the beach, they make a long and dangerous journey from the sand to the surf. And their only sense of direction is the moon; they follow its light. So, you can see why it would be a problem if hotels and houses along the beach had bright lights that, to a baby turtle seeing the world for the first time, looked exactly like the moon. There are predators everywhere waiting to swoop in on the tiny, scurrying creatures, and a couple of extra minutes confusedly walking around the beach could be deadly. Another thing the Hawksbill project did was use satellite transmitters to track post nesting female hawksbills. This allowed the researchers to get up-close looks at the turtles’ lives and movement. They also coordinated a Turtle Watch Program to further determine their locations and numbers. Through talking to the organizations president, I found out that our donation would go towards special technology or research equipment, and the salaries of the workers – someone needs to organize all of the work they’re doing. Overall, the project went into great depth and really showed interest and concern for hawksbills, the most endangered sea turtle in the world. Their dedication to field research and education programs in Hawaiian schools were very inspiring, and I know that any money donated to this cause wouldn’t be a waste. The Youth Philanthropy Team had six members and only five thousand dollars, so after voting, we decided to give the top three organizations $1000 each. The remaining $2000 was split among the three organizations with fewer votes, which came to about $665 dollars per project. All of the organizations were very reliable and great investments, and I am overjoyed that we were able to give away the money to such a great cause. I highly suggest that all of YOU donate a little bit of money to a conservation organization of your choice; not only will it make you feel great, but it will help to save our planet.